Pastor Bryan Wolfmueller is the pastor of Hope Lutheran Church in Aurora, Colorado. He is married to Keri, and they have four children. 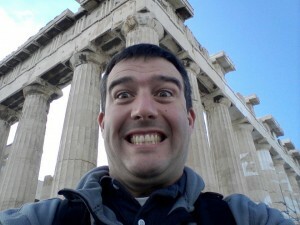 Bryan is the co-host of Table Talk Radio, and enjoys reading, writing and talking theology. Bryan really likes Law and Gospel. Sarah is a coffee-drinking, wine-tasting, book-loving, hyphen-obsessed, word maven and travel wanna-be. Even though her father is a missionary/professor in Siberia, Russia, the sum of her international travel experience has been spending an afternoon in Canada. 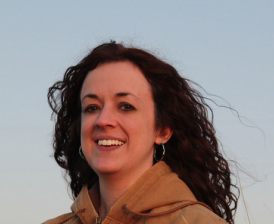 She is also a freelance writer and editor, and the Office Manager for LOGIA: A Journal of Lutheran Theology. Sarah is extraordinarily blessed to be able to work from home so that she can (sort of) keep up with her four kids; twin girls, age 14, and two boys, 10 and 9. On the island of Patmos! 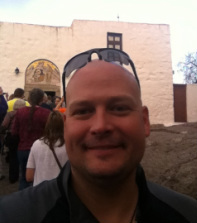 Well, this is me on the island of Patmos in 2012. It was amazing to actually be in the location where John wrote down the Revelation given to him by Christ Jesus. What an amazing experience!!! I currently live in God’s country (Colorado for those that don’t get to live here too ). I am married to my best friend, Jill. We have two wonderful boys that keep us busy all of the time, ages 8 and 11. I love reading, spending time with my family, hunting, and now foreign traveling when the ole’ bank account allows for it. My family and I are diehard College Football fans and love watching our Colorado State Rams every Saturday. We just loved watching our Rams come back and beat Washington State in this year's New Mexico bowl! I am so thankful to be a part of this project. Being able to be a part of spreading the Gospel message in this method brings me great joy. It is my hope and prayer that this publication reaches many people with the hope, joy, and salvation that is freely given to us through Christ.